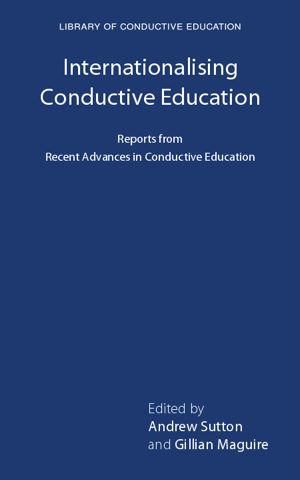 At long last I can announce that the Virtual Library of Conductive Education now has a new format – and a new home, thanks to Ben Foulger. Ben has spent a lot of his own time in the past few months creating a searchable database for the Virtual Library and in the process been very patient with my requests for all sorts of features, changes, yet more changes and further additions – he has managed them all. Wonderful. will gradually be included along with new items and the same criterium applies for those, that is availablility on the Internet. Some are free to acess and some require a subscription, password or payment for an individual article. So far items included are written e.g. articles, conference papers, documents, presentations. Films and videos may be added later. I have added over 100 items to the catalogue so far, but as you can appreciate transferring the material from the blog to the database takes time. I will add any new finds straight into the new format – in fact I have added some already – whilst continuing to ‘move’ the old items across. The blog will remain and not be deleted until this process is completed. Some people may be unused to searching a catalogue online, so there is a link to a help page containing some basic instructions and guidance. This catalogue, like all ‘live’ library catalogues, will never be ‘finished’ as more new material becomes available and is recorded. I welcome any help you can offer in finding such material. You will see that there is also a link to a Depository on the same page. It is hoped to put complete documents, unpublished papers, articles etc not available elsewhere into this starting very soon. At present it is empty. As always, if you have any queries, suggestions for improving the new set-up or suggestions for inclusion, please do let me know. Ludwig, S, Leggett, P Harstall, C. (2000) Conductive Education for children with cerebral palsy. Edmonton: Alberta Heritage Foundation for Medical Research. This is the only review so far to make a major critical proposal to better the quality of how evaluations done in Conductive Education. There were relatively few studies to look at, with five being carried out in Australia, three in the UK, and one in Ireland. The review gives an outline of its parameters followed by a brief description of Conductive Education and its origins and then goes on to look at six primary studies and three studies that examined parental reactions, perceptions and satisfaction. It sets out their summaries in the form of a table, giving the type of study, (e.g. randomized or non-randomized, controlled, descriptive), setting, (e.g. UK, Australia), the methods, and authors’ conclusions, and then discusses each one in more detail. This is followed by a summary of the main, conclusions, a discussion of these, and the authors’ conclusions. And, of course, a list of references. Also included are several appendices on methodology, cerebral palsy, CE models in Alberta, primary and parent studies (including outcomes and comments). All set out as tables. Their radical suggestion for the betterment of such evaluations was ‘manualisation’, I.e. actual stating in he form of a ‘manual’ what is was that was actually done with the subjects in the intervention being evaluated (a well known measure in clinical psychology). If one does this then it may even be possible that studies might be replicated. If not, then they cannot be. It would also offer readers of reviews to form thie own judgements of how far then work being evaluated in fact merit the name of Conductive Education in the first place (not a lot, probably in many cases. As far as I know, no later studies have taken up this suggestion. Hári Mária, Székely Ily (1963) Bevezeto A Konduktiv Mozgaspedagogiaba; Pető András eloadasai es gyakorlati bemutatoi alapjan. Gyogypedagogiai Tanarkepzo Foiskola, Budapest: Tankonyvkiado. Judit has a copy given to her by Ester Cotton, who had had the book signed by Maria Hari , making it a very special item of CE literature. I remember this book, as it was held in the National Library of Conductive Education whilst I was there. Several people have asked me if it will be possible to buy books published by Conductive Education Press at the Congress. CEP is a publisher and not a bookseller with premises and a physical stall. Single copies of the titles will be available to look at during the Congress and a leaflet to take away containing information about all titles. I believe there may be information about a book from the Peto Institute available in the same way, Susie Mallett is working on a pamphlet, and there may be others too. Usually at conferences books are available to order, rather than purchase there and then. A catalogue or titles may be available to look at and a form provided to complete to obtain copies. Sometimes there are copies available to buy, but not often; for instance, if the congress is being held in the home country of the publisher it would be possible to take multiple copies to sell – perhaps SAHK will do this with their publications. No airline luggage restrictions for them! By the way, feedback from all of you who obtain and read copies would be very welcome. 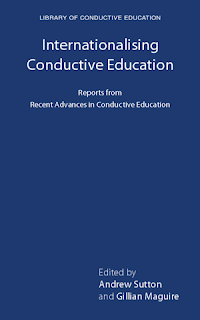 It looks as though 2010 will see the publication of at least four titles on Conductive Education, quite an achievement! Internationalising Conductive Education edited by Andrew Sutton and Gillian Maguire. One group of articles in Recent Advances in Conductive Education(RACE), published across the years of the journal’s appearance, stand out as manifesting a common, coherent theme, one that has continuing relevance today. These articles may be collectively characterised as personal accounts of setting up and developing one’s own conductive practice, or service, or even system. Such determined and individual self-help, often in the face of surrounding indifference or even outright opposition, has been the base and backbone of the internationalisation of Conductive Education. In a continuously changing world, it will likely remain so. There is no other accessible written record of this process, no other collection of documents to suggest just what it takes to do this, none to offer reassurance, inspiration – and caution – to those who might wish to plough their own future furrows So, it has seemed a useful exercise to collect together these varied and needed articles into a single volume – this book. Contributors ( in no particular order ) include Judit Szathmary, Judit Roth, Kari Hapnes, Lisa Gombinsky, Rony Schenker, Naomi Rotem, Lisa Gombinsky, Wendy Baker, Istvan Szucs, Gemma Davy, Laura Jones, Rachael Skinner, Norman Perrin, Gabor Fellner, Márgara Millán.